Nowadays almost every age group people suffer from hair loss. One can opt for various treatment solutions as suggested by the doctor. It may be tough to decide among the surgical and non-surgical hair restoration procedures. As both having their own significances. Be it a surgical or non-surgical procedure, the main objective is to get desired long lasting results. Hair loss is very common problem that can affects age group across the spectrum. When conservative management is not giving benefit and the indication is there then Hair Transplant comes into picture. Hair Transplant is a surgical procedure for hair restoration for men and women. The hair transplant procedure restores hair by transplanting grafts (hair follicles) from donor area to the bald area (recipient area). Grafts or hair follicles can be extracted using two methods – FUE (Follicular Unit Extraction) and FUT (Follicular Unit Transplantation). In FUE, the doctor takes individual follicles from the donor area and transplants them to the bald area. For the extraction micro punches are used. This is relative painless procedure. This method has faster recovery and for the people who don’t want cuts, stitches on the scalp and wants to have hair styles of short hair. In FUT, the doctor or surgeon cut a strip of scalp from the donor area and dissect them into individual grafts under magnification. There may be feeling of tightness on scalp. There will be a visible linear scar. Now question arise, if hair transplant is a permanent solution to hair loss? 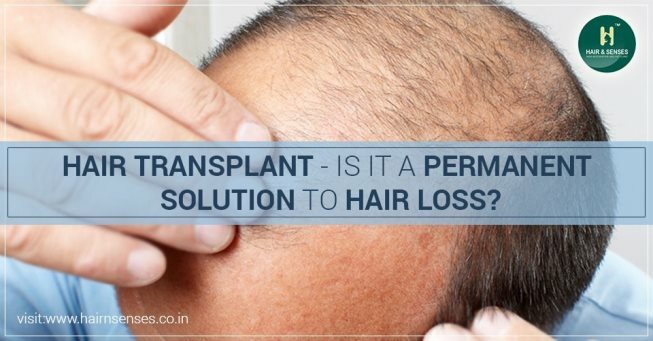 The answer is yes, Hair transplant is a permanent if it is done on the healthy scalp and the patient is not suffering from any other medical disorder causing hair loss. The permanent hair bearing area or the donor area is resistant to DHT (Dihydrotestosterone) which is the hormone responsible for hair loss. DHT plays a vital role in male pattern baldness. Once after recovery, the hair will remain in the same place for the rest of one’s life. Results stays for life time if done properly and done by experience surgeon. The patient must follow all post-operative instructions provided by the surgeon in order to assure better results. Your surgeon is your best friend who can help you to get the desired results for the surgery. All you need to do is simple follow all instructions properly and take care of your scalp or transplanted area. All the best for your hair transplant procedure.